Citation Information: JCI Insight. 2019;4(2):e124575. https://doi.org/10.1172/jci.insight.124575. Systemic lupus erythematosus (SLE) is a highly variable autoimmune disease that can involve severe organ-threatening symptoms, such as lupus nephritis. Certain drugs, such as mycophenolate mofetil (MMF), are effective at reducing morbidity associated with nephritis; however, the immune pathways associated with disease suppression are poorly defined. Here, we provide evidence that MMF inhibits phosphorylation of STAT3 and other associated immune pathways. Using mass cytometry and bead-based or ELISA assays, the systemic phenotype of SLE patients not taking (MMF–) or taking (MMF+) MMF were studied. MMF+ SLE patients had significant reductions in total numbers of transitional B cells, plasmablasts, and T cells, specifically CD4+ Th17-type and CD4+ Treg-type cells, compared with MMF– patients. Plasma soluble mediators were decreased in MMF+ patients including chemokines (MIG/CXCL9 and SDF-1α/CXCL12) and growth factors (VEGF-A and PDGF-BB). Soluble mediators and cell subsets grouped by functional properties revealed significant modifications associated with STAT3 and B cell pathways. Further, healthy PBMCs treated with IL-6 revealed a reduction in p-STAT3 following the addition of mycophenolic acid (the active metabolite of MMF). In conclusion, the inhibition of STAT3 phosphorylation by MMF may explain the effectiveness of this treatment in SLE patients, since increased levels of p-STAT3 are associated with disease pathology. t-SNE analysis pipeline identifies 22 phenotypically distinct populations in PBMCs. (A) Dimensionality-reduced t-SNE plots (using 33 surface markers) from concatenated PBMC data (110,000 cells) of MMF+ or MMF– SLE patients are shown by density maps and dot plots. Clusters are numbered and described by phenotypic subtype. All plots were derived from 10 individuals in the MMF– group and 5 individuals in the MMF+ group. 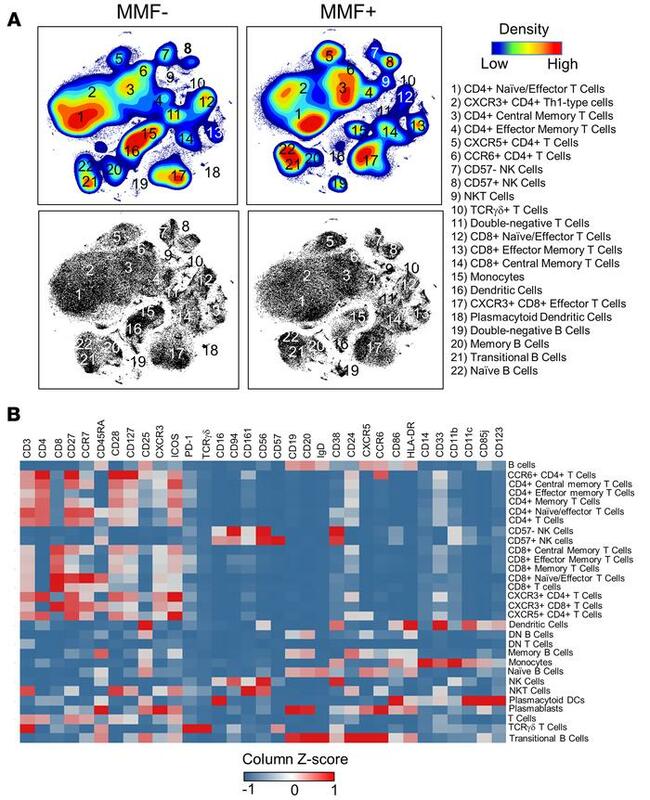 (B) A heatmap summary of the expression values of all 33 cell surface markers are used to distinguish identified cell subsets. Marker values are displayed on a color scale ranging from blue (levels below the mean) through white (levels equal to the mean) to red (levels greater than the mean) using a column Z score.